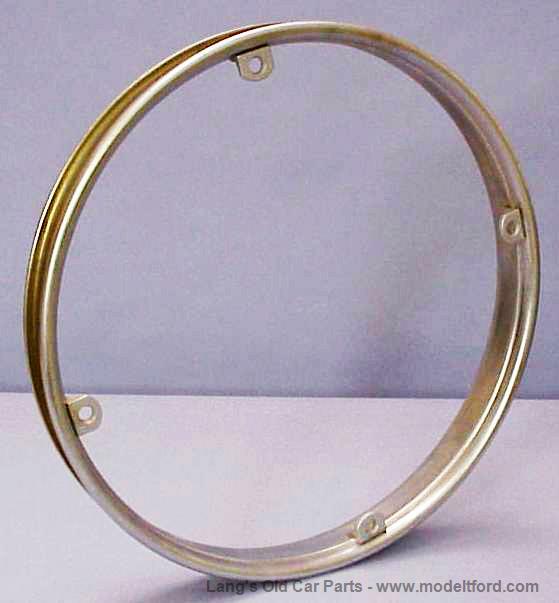 30X3-1/2 Clincher rim, with lugs, for use with demountable wheels. 30X3-1/2 Clincher rim, with lugs, for use with demountable wheels. American made, Excellent Quality Reproduction. Exact reproduction of the original demountable 30 X 3-1/2 rims! Made with correct wheel bolt lugs, beads and clincher rolled edges. The lugs are fitted into a slot as original, not just welded on as you find on cheaper reproduction rims. NOTE: The lugs are not "L" shaped, they go straight in to the rim. L shaped lugs can be special ordered. Is the part of the demountable wheel that the spoke ends recess into that gets bolted to the rim included in this part number? If not where is that wheel part reflected in your catalog? The piece that the you are referring to is called a furrow. This piece is not included in the rim that we sell. Unfortunately no one is making reproductions of this item. From 1909-1920 they were made of wood, and after 1921 they were made of steel.